Facility directors and managers of national retailers have enough to worry about besides whether the work they are paying for actually gets completed. That’s why at Springwise, we’ve asked the International Organization for Standardization to get involved, in proving that we not only take responsibility for work validation, we take it very seriously. ISO (International Organization for Standardization) defines, establishes and maintains a set series of standards and an effective quality assurance system for manufacturing and service industries. Dealing with the fundamentals of management systems, these standards are designed to help organizations uphold their responsibility of delivering satisfactory services to their customers. A third-party audit based on samples of an organization’s sites, functions, product services and processes is utilized to assess compliance. A report is then prepared and presented to the audited company detailing any ISO standards that aren’t up to par and a timeframe to correct any trouble spots is identified. Once all listed problems have been corrected, the organization is then qualified for certification. 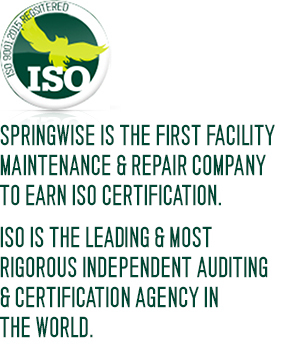 Dedicated to providing the best customer experience possible, Springwise Facility Management gets audited every year for independent confirmation that we’re ISO compliant, ensuring that our standards meet the highest industry expectations and our clients’ needs are foremost in our mind. “We deliver” is more than a saying at Springwise, and our pledge to continue to execute our services at an ISO standards level is just one way we’re making good on that customer commitment.